The next Writers in the Schools Committee meeting will be announced soon. 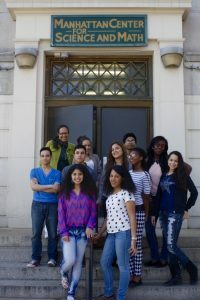 Now entering its fifth year, Writers in the Schools places PEN America Members in New York City schools that serve students from under-resourced communities. At a time of rising anti-intellectualism, when all the arts are under attack, the goal of the Writers in the Schools Committee is to help nurture a love of reading and writing among New York students. The committee is currently chaired by James Traub. Volunteers work with students and teachers to build skills, conduct creative writing workshops and writing clubs, and oversee the publication of literary magazines and school newspapers. Tutors adapt to schedules of individual teachers, schools, and volunteers. Your commitment, as a rule, will be to volunteer at a school for an hour or so weekly. “Over many years writing about the schools in The New York Times Magazine and elsewhere, I had discovered that even very bright students who did well in math and science often wrote very poorly. Many grow up without books and with few opportunities to enrich their language skills. I thought that professional writers might be able to work with teachers to help those students learn to express themselves in writing. 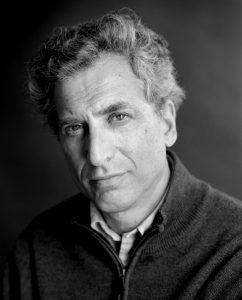 PEN America offered just such a pool of writers. 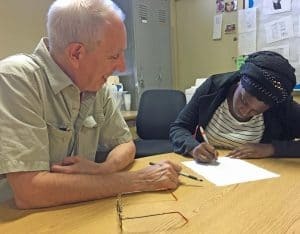 In the fall of 2013, volunteers from PEN America, and teachers and administrators in New York City public high schools, came together to create a tutoring program. BCS is a charter school based on the Expeditionary Learning Outward Bound model and serving students in grades 6 to 12. PEN Writers has two volunteers working alongside an extraordinarily gifted and enthusiastic English teacher in 12th-grade classes. Another volunteer is just beginning to work with BCS’s college guidance counselor to help seniors with their college essays. Check out what Andrew Boorstin, a teacher at Brooklyn Collaborative, says about the impact PEN America Members have had in the school. Renaissance is a PreK–12 school largely organized and run by the school’s own teachers. PEN America has one volunteer there tutoring students after class. We will soon begin to work with a start-up school newspaper. MESA is a five-year-old school serving the most disadvantaged students in a largely disadvantaged neighborhood—yet it graduates over 90 percent of its incoming 9th-grade students. In the past, three PEN America volunteers helped establish an after-school literary club. This year we will have a volunteer working alongside a teacher in a 12th-grade English AP class. Townsend Harris is the descendant of the storied institution that for generations served as the feeder school for City College. Today it serves the same population of immigrant strivers, but from the campus of Queens College. We will have a volunteer working with the award-winning school newspaper, The Classic. MCSM is a public high school that serves students who score in the upper half of the distribution in standardized science and math tests. MSCM was the first school with which PEN America began working. At the outset, volunteers worked with teachers in 9th-grade writing classes. Now we have two volunteers working in an after-school tutoring program, one working with students on college essays, and another who serves as the advisor to the school newspaper, RamPage.